GL's VQuad™ Probe HD is an all-in-one self-contained node supporting multiple physical interfaces for connecting to practically any wired or wireless network while automatically performing voice and data testing. This comprehensive hardware device incorporates all the features of the current VQuad™ with Dual UTA HD unit such as portability and remote accessibility along with the necessary PC with Win7 OS. The Probe is designed for easier portability and convenient testing with all the capabilities of the current VQuad™ with Dual UTA HD solution. The VQuad™ Probe HD is of same length as the current Dual UTA HD hardware, but about twice as high and 50% wider. For exact dimensions, refer to the specifications. 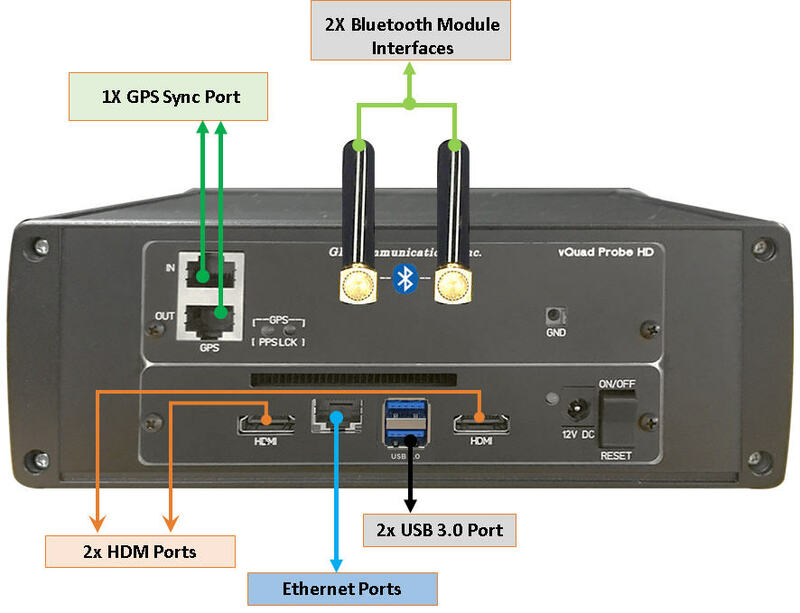 The VQuad™ Probe HD supports two independent devices for connecting to endpoints of a single network or two completely separate networks. 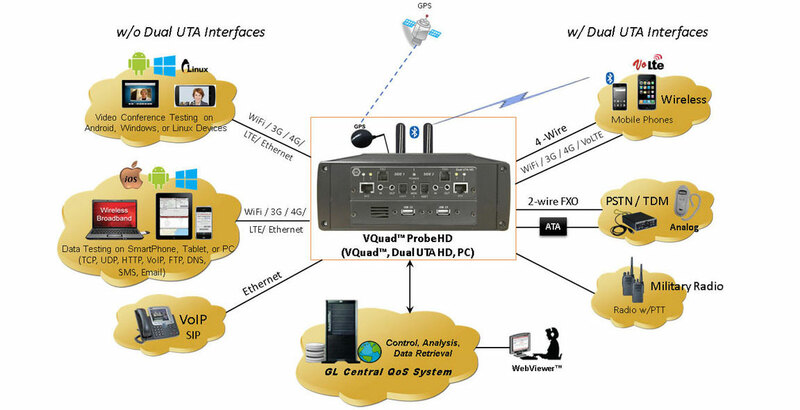 The VQuad™ Probe HD is configured for control via Ethernet using Remote Desktop (thus not requiring the Keyboard/Mouse). With additional licensing (VQT274) VQuad™ Probe HD can connect to Touchscreen Monitor. VQuad™ Probe HD unit can connect to a portable 10” monitor with touchscreen access via USB interface, which also includes virtual keyboard. There are no moving parts with the VQuad™ Probe HD so reliability and longevity are integral. 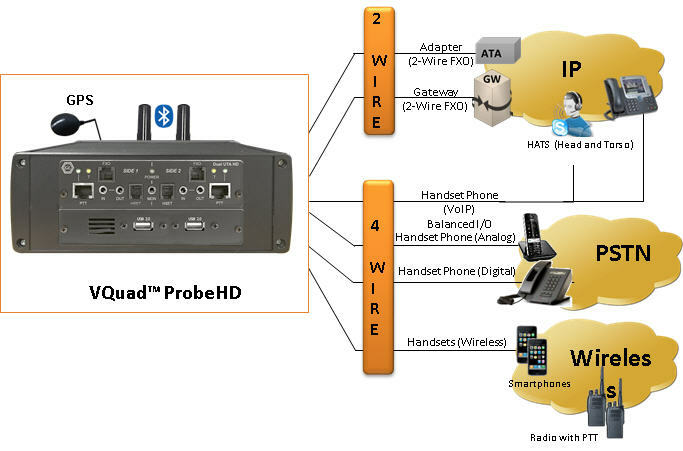 VQuad™ Probe HD allows to test variety of networks, including Wireless (Bluetooth®, Wi-fi, 3G, 4G, LTE, PTT), VoIP, Analog, and TDM, practically allowing any end-point interfaces to be tested for voice, data, and video quality. Various associated applications (Voice Quality, Video Quality, Data tests, Echo and Delay tests, Fax tests, Voice Band Analysis) works with VQuad™ to provide "end-to-end assessment" with additional test and measuring capabilities. Different types of traffic supported includes - NB and HD Voice, Video, Tones, DTMF/MF Digits, Fax, and other Data (HTTP, UDP, TCP, SMS, Email, DNS, Route, and FTP). Side: The VQuad™ Probe HD contains Side 1 and Side 2. These sides (devices) are completely independent of each other, so Mobile Phone Network Testing could be setup on Side 1 while FXO Network Testing could be configured on Side 2. FXO Jack: The RJ-11 2-wire analog jack gives the VQuad™ Probe HD the ability to act as a telephone. This is a 2-Wire POTS interface that allows users to place calls, answer calls and utilize all of the probe’s voice quality and delay features. Push-to-Talk (PTT) with LEDs - Side 1 & 2: For use with radios that requires activation of a push-to-talk function to transmit or receive audio signals. There are two RJ-45 Jacks (PTT) one for each side of Dual UTA HD. The RJ-45 jack is connected to the software-controlled relay internal to the probe. When PTT is active (PTT LED on), pins 4 & 7 are shorted. A single RJ-45 PTT port includes the TX/RX 4 wires along with 2 wires for PTT operation (keying radio on/off). PTT LEDs: When illuminated indicates that the PTT function is active. The active state indicates that the radio has been placed in transmit mode. Conversely, the inactive state (LED off) indicates the radio is in receiving mode. Trigger (TRG) LED: When illuminated indicates that a Round-Trip Delay (RTD) or One-Way Delay (OWD) pulse has been detected. This LED may also illuminate momentarily when connecting or disconnecting audio lines. In Jack: This 3.5 mm jack provides a balanced Audio In port. This jack can connect to a wide variety of the network interfacing equipment. Multiple impedance options are also available with this input. Out Jack: This 3.5 mm jack provides a balanced Audio Out port. This jack can connect to a wide variety of the network interfacing equipment. Multiple impedance options are also available with this output. Handset (HSET) Jack: This RJ-22 jack is used with handset-type phones. Connect the curly cord of the handset to this jack. Monitor Jack: This 3.5 mm jack (stereo miniature phone type) provides for connection of a headset or amplified speakers to monitor the Audio In/Out signals on all interfaces. Power LED: When illuminated indicates the VQuad™ Probe HD is receiving power and is ready to operate. The Probe is powered from the pc connection. USB Jack: Communications and power interface connection. Connect a second Dual UTA HD or T1 E1 Analyzer unit or any USB device. Connect to the computer USB port directly or through a USB hub. GPS (In): RJ-45 Input jack from external GPS receiver. The VQuad™ Probe HD uses location and time to provide additional information to the user. The one pulse-per-second GPS input will allow 1 ms accurate one-way and round-trip-delay measurements. GPS (Out): (RJ-45 Output jack) The VQuad™ Probe HD allows the GPS received data on the GPS (In) port to be transmitted out the GPS (Out) port. This enables a single GPS receiver to provide data to multiple Dual UTAs. Bluetooth® (BT): The VQuad™ Probe HD has Bluetooth® built in, which allows users to connect to Bluetooth® enabled devices. This provides call control (control of phones calling/answering functions), the ability to send/record audio in/out of these devices as well as VoLTE testing supported using Bluetooth®. USB Jack: Communications and power interface connection. Connect a second Dual UTA or T1/E1 Analyzer or any USB device. The probe on the back panel includes USB 3.0 and USB 2.0 ports. LAN (1 & 2): 2 GBit Ethernet ports used to connect the device to the LAN network using RJ-45 connectors. VGA: Display VGA (Video Graphics Array) ports, used with VGA cable which connects to computer monitors or any display units. COM: Serial COM Port, data transfer through serial ports connected the computer to devices such as terminals and various peripherals. PPS: (GPS PPS Yellow/Green LED) When illuminated indicates that the GPS function is active. The active state indicates that the GPS has been placed in transmit mode. Conversely, the inactive state (LED off) indicates the GPS is in receiving mode. 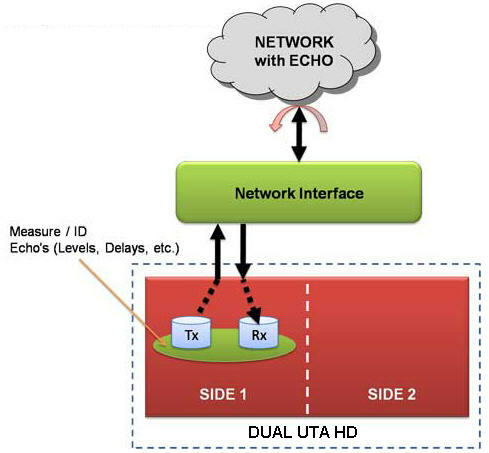 Wireless networks can impair voice quality by various means including poor mobile phone quality, voice/video compression and decompression algorithms, delay, loss or gain in speech levels, noise, acoustic and landline echo, and other distortions. GL provides a compact and portable solution for testing Wireless and Mobile Radio devices for voice, video, and data quality using the GL VQuad™ application with the Dual UTA HD, or all-in-one VQuad™ Probe HD. The Dual UTA HD includes interfaces for Push-to-Talk for mobile radios, and Bluetooth for connecting to any mobile phone. All results along with call control information are sent to central database. Query results remotely using the WebViewer™. GL's VQuad™ with Dual UTA HD provides the solution for testing analog 2-wire interfaces (PSTN, ATA, Media Gateway). 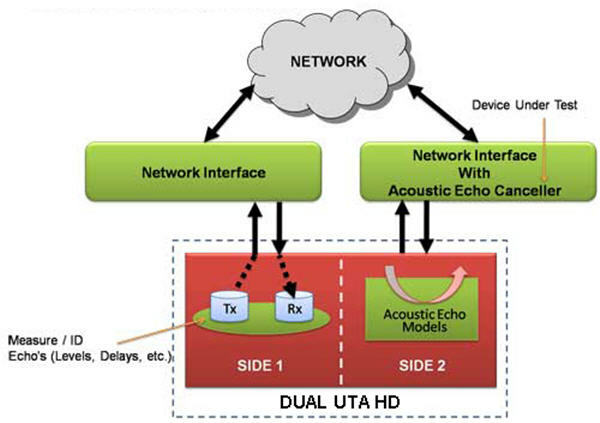 The Dual UTA HD supports 2 Analog FXO interfaces (RJ11) and provides Off/On- Hook, DTMF Dialing, Flash Hook, Tone Detection (Dialtone, Ringback, Busy, Fast Busy, SIT) and CallerID. 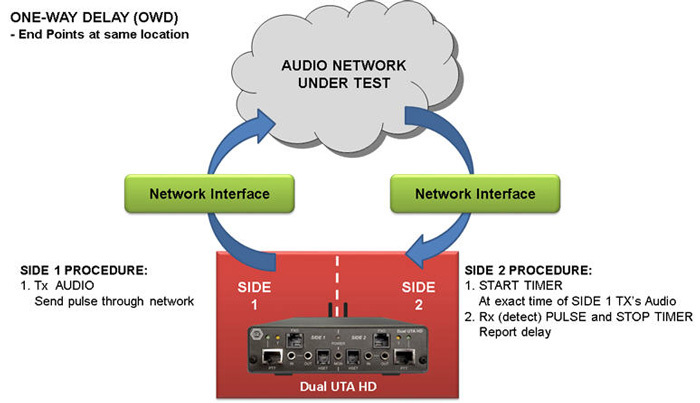 The Dual UTA HD Analog interface supports two-stage dialing, IVR testing, Voice Quality Testing, Delay Measurements, and Echo Measurements. With the growing requirements for voice quality testing within VoIP networks, a major concern is testing the VoIP Network, VoIP phones, VoIP Softphones, and Analog Telephone Adaptors (ATA). GL's VQuad™ with VoIP option, provides the ability to perform manual or automated tests on Softphones in the VoIP network. 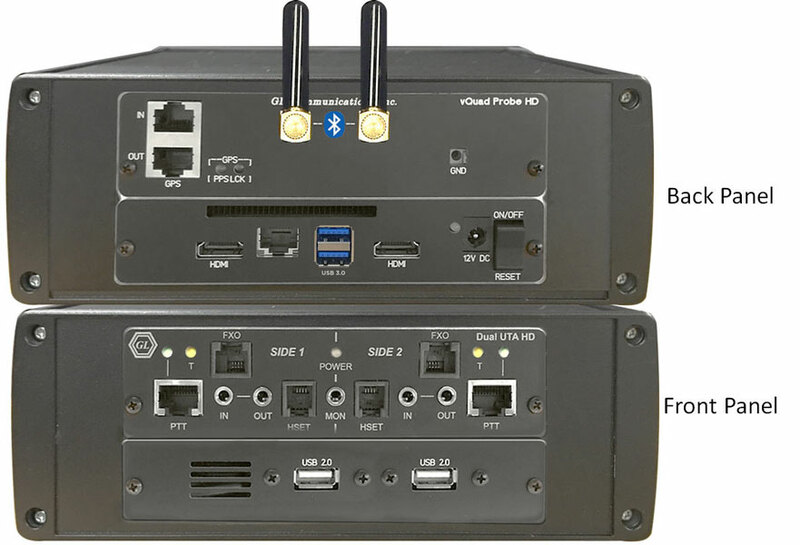 The VQuad™ provides direct connection to the VoIP network with up to 12 user agents per VQuad™ connected simultaneously. SIP Call Control within VQuad™ supports handling up to 4 SIP cores, and support up to 12 User Agents. Supports outband DTMF/MF digits for RFC4733 and RFC2833. Supports almost all standard Voice Codecs (G.722, AMR, G.729 & more). Using the T1/E1 Analyzer, the VQuad™ can generate and receive up to 12 simultaneous CAS or PRI ISDN or No Call Control (NOCC) calls on T1 or E1 trunks. Once the call is up, send/record voice via the VQuad™ to get VQT MOS results. The T1/E1 option includes a script based CAS State Machine for creating any desired CAS protocol. Included with the PRI ISDN are all variants associated with ANSI and ETSI specifications. Also supports No Call Control (NOCC), where the T1/E1 call is connected without any call control required. Audio analysis of any recorded voice file for both Power and Frequency. RMS power and frequency response outputs are necessary for testing the network for full WB voice support. Assess sidetone, line, and acoustic echo and the corresponding delays. Measure Active Speech Level, Activity Factor, RMS Factor, DC Level, Noise Level, Echo Return Loss, Echo Delay, and Echo Dispersion statistics. All VoIP Codec supported including - G.711, G.711 App II with VAD, G.729, G.726, G.726 with VAD, GSM, AMR NB and WB, EVRC, SMV, iLBC, SPEEX NB and WB, G.722, and G722.1. Visit Voice Codecs webpage for more comprehensive information. VQuad™ is enhanced to support Data Testing including TCP, UDP, VoIP, Route, HTTP, FTP, DNS, SMS, Email, PhoneInfo, SimInfo, and UEInfo. The Data Tests are configured via the VQuad™ scripting and supports Wireless devices as well as PC Ethernet connections (wired, WiFi, Broadband 3G/4G, and LTE). Different type of tests supported – TCP, UDP, HTTP, FTP, DNS, VoIP, Route, SMS, Email, PhoneInfo, SimInfo, and UEInfo. Remotely perform Data tests from GLNetTestApp on mobile devices (iPhone, Android); this requires connection with Mobile Device Controller server. Mobile device communicates with Mobile Device Controller from anywhere in the world. Fully automated and remote testing with all results accessible via WebViewer™. VQuad™ can now initiate, control, test, and measure video conferencing services over IP, and Wireless networks, using additional support of a Video Controller/Server and Video Clients (Agents). Video Tests can be configured between any two active video clients with flexibility of specifying the typical characteristics of the Video test. 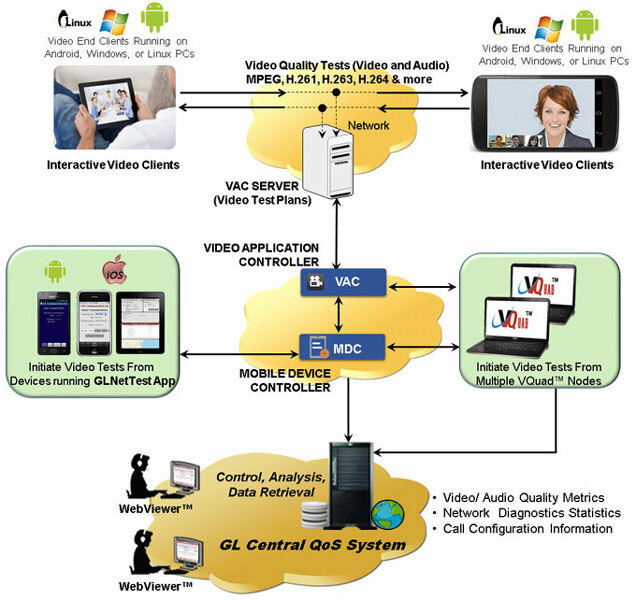 Video Test agents generates simulated video calls to other test agents as per these test parameters. The GPS mapping records and adds the real-time GPS information to all test results and VQuad™ call control. GPS information is automatically sent to central database and accessed via Google Maps feature in WebViewer™. Tx and Rx fax rate from 2400 baud to 33600 baud with V.34 fully supported. Interfaces supported for fax generation include 2-wire FXO and 4-wire analog. Automatically save the fax session (both East and West directions) to a PCM file. Supports higher resolution and multi-page fax TIF files. Use GLInsight™ or GL Fax Scan analysis software packages for further analysis of the recorded fax files. GL's FaxScan™ can be configured for fully automated analysis.